If you’re lucky enough to have an intelligent, lively and energetic team, don’t kill their buzz. You employed them for a reason. Perhaps you’re armed with punctuation police or research rabbits that hop from site to site gathering information like there’s no tomorrow. These are great qualities. So even if the work gets tough or a client’s demanding, here’s how to boost your team’s content creativity and keep it at optimum levels throughout the day! When heading a creative team, you must lead by example. If you’re tired, frustrated or not at all bothered by a project that lies ahead, how do you expect your crew to act? Like seriously? Ditch the hangovers, ditch the negative ‘can’t do-won’t-do’ attitude and start walking around with a spring in your step. Be positive, be proactive and get the ball rolling with face-to-face briefings that are upbeat, humorous and full of character. Even on a Monday morning! Hosting lively meetings fuelled with rewards for good ideas. Hint: donuts always go down well and provide a much-needed sugar hit! Taking your team off-site to a new location. This can sometimes reboot the mind and help people remember why they chose a creative career in the first place. Showing incredible examples of past work. This could be company projects or achievements by other organisations that you think rock. Watch this incredible TEDx talk doing things the Disney way for inspiration. Hey, why not even show the clip to your team and come up with your very own ‘magic formula’ for content creativity? Remember, inspiration can come from anywhere helping you to achieve those all-important targets and goals. As the head of a team, you must make decisions. In a competitive environment there’s often no time for wishy-washy thought processes or unconfident plans. That said; it’s crucial to listen to all ideas that are brought to the table. 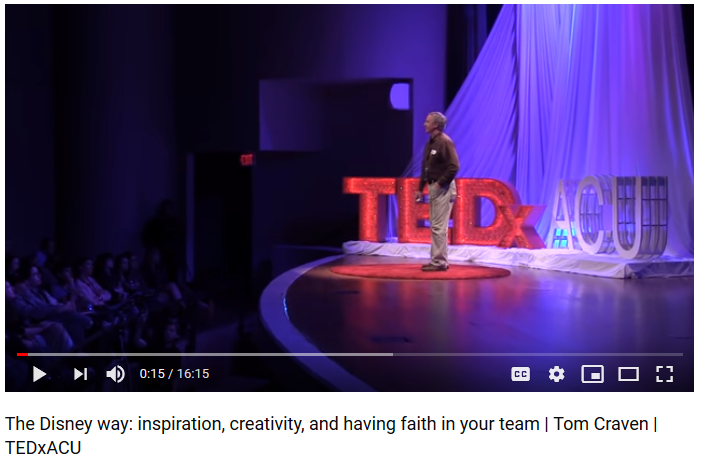 As ex-Disney employee Tom Craven explains in the video above, one of the most innovative and creative ideas put forward to a team of Disney watercraft theme-park experts came from a high school student with no previous experience. I’m not saying you need to pluck random people off the street for insight. But what I am saying is that even the shortest sentence or most vague ideas can have huge potential. All sparks of knowledge and information can be explored in order to breathe life into a project. Brainstorming and mind-mapping can be done in many different ways, but one of the best processes if you’re all together in a physical environment is as follows. Write a specific topic or theme on a large piece of paper. Put out Post-It notes and black markers. Encourage people to interact and engage by asking them to write associated words down and stick their thoughts to the bigger piece of paper – or the ‘ideas hub’ if you like. Once that’s done, select three words that most stand out. Stick them to a new piece of paper and repeat the process. This will then lead to more specific ideas which can be broken down further encouraging people to think outside the box, encourage content creativity and explore a theme more widely. Finish by selecting three of the most relevant words from your new mind map and exploring creative ideas around them. You should find the room comes alive as brains are put to work. If you want to crush creativity. Go ahead and micro-manage every single little task you ask of your team. As soon as your staff feel they’re being heavily watched, judged, monitored or restricted, their creativity will die a sudden death. Many creative folk like to be given a free rein in order to reach deep into their own minds and bring out the juicy stuff. Of course, there may be rules to follow. Particularly if you work in the finance sector or some other heavily governed industry. But so long as there’s a clear brief and your team are all fully aware of what they can and can’t do, give them a chance to prove themselves. As the Creative Director of Contentworks agency, I know how important it is to keep team spirit and creative momentum high. Get in touch today for more information or content marketing and strategy for your team.